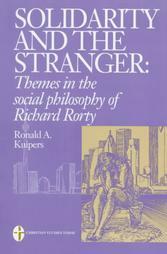 Kuipers, Ronald A. Solidarity and the Stranger: Themes in the Social Philosophy of Richard Rorty. Lanham, Md. : Institute for Christian Studies : University Press of America. 1997. Recommended in the "Guide to Further Reading"
In a critical yet sympathetic examination of Richard Rorty's philosophy, the author uses the biblical figure of "The Stranger" to explore some ethical tensions in Rorty's affirmation of a liberal polity. The book begins with an exegesis of Rorty's work in epistemology and metaphilosophy, especially as these subjects are developed in his magnum opus Philosophy and the Mirror of Nature. After appreciating Rorty's critique of epistemology-centered analytic philosophy, the book moves to explore Rorty's peculiar appropriation of pragmatism, and his rejection of philosophy as a foundational discipline or "superjudge" of human cultural practice and belief. ...captures the promise and limitations of Rorty's ideas and the convergence and dissonance Kuipers experiences with Rorty's work. ...a suitable study for graduate students and academicians...a rare sympathetic yet critical treatment of Rorty's influential work...especially from a religious perspective, this book is recommended. ...a good introduction and primer to Rorty and his social philosophy. ...a commendable introduction to Rorty's social philosophy, accessible to college students but of sufficient depth for more advanced work.